Note: XPell CE works by converting reactive, explosive peroxides into nominally non-reactive alcohols that are not likely to interfere with UV-VIS measurements, most analytical methods, and organic reactions and separations. For most solvents, the purity will remain high (impurities less than 0.1%) for over 12 months even with continuous exposure to oxygen and light. For many analytical uses, an open bottle containing XPell CE is expected to remain viable (impurities 100 ppm or less) for over two months or longer depending on the storage conditions. Given the non-reactive nature of the byproducts, many applications will be able to use the solvent protected with XPell CE for a much longer period of time. The user is encouraged to verify that the products generated from peroxide neutralization do not cause any interference with their chosen analytical method. For each liter of solvent, add one tablespoon (approx 10g) of XPell. 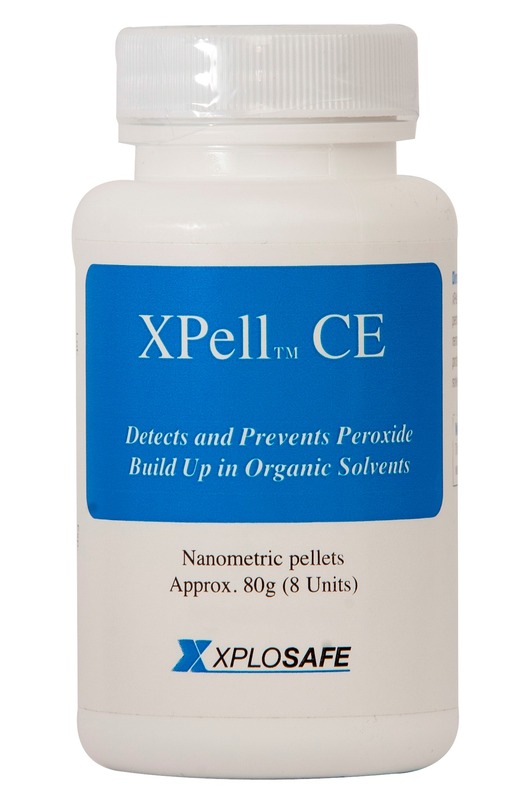 XPell neutralizes peroxides present in the solvent and peroxides that form over time. The solvent is protected as long as XPell pellets remain dark greenish gray. A color change to a yellow/pale color indicates that the protection is exhausted. Once this change occurs, add more pellets to the solvent until the color of the additional pellets remains dark greenish gray.